The trailer for one of DC’s latest additions, “Aquaman,” came out a couple of months ago. When is the movie releasing, and what can the audience expect? The “Aquaman” trailer begins in a gloomy state – the typical dark and stormy night. Aquaman, played by Jason Momoa, begins to narrate his backstory. His father (played by Temuera Morrison) was a lighthouse keeper, a human, and his mother (played by Oscar-winner Nicole Kidman) was a queen, an Atlantean. Thus, Aquaman, also known as Arthur Curry, reveals himself as half-human and half-Atlantean. His parents were separated by the different worlds they lived in. “You could unite our two worlds one day,” his mother whispers to Arthur in the trailer. As a child, Arthur remains on land. In the next scene, we spot a young Arthur at an aquarium, talking to the sea life. Two older kids make fun of him for “talking to the fish.” But little do these kids know that Arthur was half-Atlantean, and had the power to actually “talk to the fish.” Sharks and fish come closer to the glass caging them in order to protect young Arthur from the bullies. One of the sharks even forms a huge crack in the glass from hitting it too hard. Of course, this astonishes everyone in the aquarium. Next, we see the older, adult version of Aquaman in an action sequence. He swims very fast and hops inside of a submarine filled with armed men. Then, an action sequence begins – with Arthur Curry fighting the armed men. It’s here where we spot a villain of Aquaman’s – Black Manta (played by Yahya Abdul-Mateen II) – who is described as thriving for revenge against Aquaman. In the next scene, we spot Amber Heard as Mera, a “fierce warrior and Aquaman’s ally throughout his journey,” as described by Warner Bros. Pictures. Mera warns Arthur and essentially reveals the main conflict: his half-brother, King Orm (Patrick Wilson), is about to declare war upon the “surface world.” Unlike Aquaman, King Orm is “pure” Atlantean, with no trace of human blood. Mera tells Aquaman that he must claim his place as King – replacing Orm – in order to put a stop to this war. Arthur refuses his fate, claiming that he is no king. 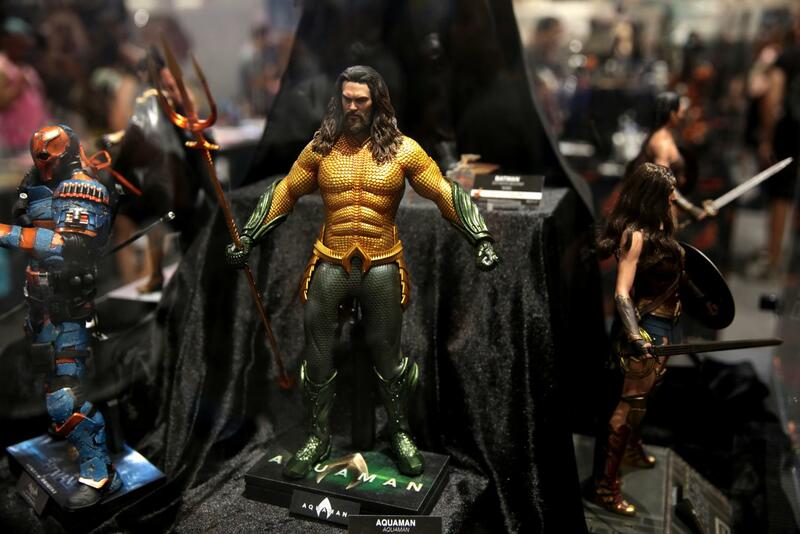 We also spot the trident, Aquaman’s signature weapon; which if you recall, he did not wield in “Justice League.” Arthur Curry’s goal is to obtain the trident so he can prove his claim to the throne. Next, we see Aquaman and King Orm facing off in an area, surrounded by an audience, in a gladiator-type duel. It seems as though they must fight in order to prove who is most worthy for the throne. We also see several flashbacks to Arthur’s youth, hinting at an origin story somewhere in this film. “Aquaman” swims into theaters on December 21st, 2018.